Bridlington Town striker Jake Day may return from injury for their game at home to Thackley to Queensgate on Saturday, 3pm kick-off. Fourth-placed Town had been due to travel to basement club Goole on Tuesday evening, but the match was postponed due to problems with their floodlights. Day could return from an ankle knock in time for Saturday’s match, while new signing Jackson Jowett could also feature in the squad for Town, while Ben Clappison is unavailable. Brid Town manager Brett Agnew said: “Jake would not have been fit for the Goole game, but he may be fit for Saturday. “Jackson would have made his debut against Goole so I am disappointed that I did not get a chance to have a look at the lad in a game because of the floodlights failing at Goole. The acquisition of Jowett on dual forms from Scarborough shows the continual building of a squad by Agnew. He added: “When I came here we had a squad of around 15 players and now we have around 22-23 players so there is a lot of cover in most positions. 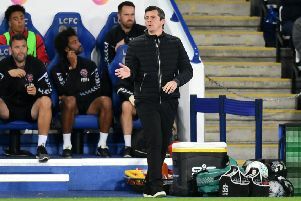 “The lads realise that there needs to be this depth in the squad, the rotation of the squad is essential if we are to push for the title and promotion. Agnew is not taking Saturday’s opponents for granted, as he admits it is hard to properly assess the strengths of some teams in the NCEL Premier Division due to their inconsistent form. He added: “You can watch a team one week and they are poor, yet the next game they can be superb. “There are about 10 teams with a chance of the title this season in the Premier Division and we will face some tricky games this month. “I fancy us at home against anyone, as I am keen to make Queensgate into a fortress as we have already had some great results. “After Thackley we have a tough game at Eccleshill United, then the matches at Worksop and at home to Knaresborough Town on December 22 and 29 respectively will be big tests against sides also going for the title. “Second-placed Penistone Church lost 4-1 at Staveley on Saturday so that’s more points dropped by one of our rivals while we have been out of action. “They had their main striker and centre-back missing through suspension on Saturday and this will have had a major say in that result. Fourth-from-bottom Thackley suffered a 3-0 home loss to Handsworth Parramore on Saturday, but they had been on a four-match unbeaten league run before the defeat so the Seasiders will need to be on top form this weekend. Thackley’s player-manager is former Bradford City midfielder Pat Maguire, who has also played for the Yorkshire IFA team, while Jordan Hendrie scored four times in their recent four-game unbeaten run so he will be a man for the Bridlington defence to keep an eye on.